Like many individuals with autism, I’m prone to misplacing things. Unfortunately, I recently lost one of the worst things you can lose; my wallet. No one wants to endure a situation as such. What should someone who has AS do in a situation like this (but may feel overwhelmed with a blank stare)? The easiest way to deal with this type of situation is not to lose things in the first place. 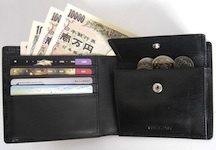 Keeping your wallet in a specific pocket and always checking to make sure it’s there before leaving places is a good rule to prevent misplacing it. Another tip is to never take it out unless you need something from it. When you do take it out, immediately put it back in the pocket in which you keep it. However, even if you try your best to keep track of it, you could still lose it. Here’s what to do if, like I did, you lose your wallet. . .
1. Contact the local police station/public safety officials. I went to the station a few blocks away and told them what had happened. They took down everything I said, and filed a report. Although the station’s policy is for people to call, my instinct was that the police don’t always respond to calls as quickly as possible. So, I walked over there. 2. Contact your bank. I called my bank’s 1-800 number listed on its website. I talked with a customer service rep., and she froze my checking and savings accounts. After leaving the local police station, I talked with my local branch’s customer service rep. (who has been helpful and another reason why it’s not a bad idea to establish a good banking relationship with your financial institution). She will be forcing certain transaction through the bank’s system, and told me if I didn’t find my wallet by Friday. She will close my accounts and create new ones (along with a debit card). Currently, I can make withdrawals from inside the local branch. 3. Contact your insurance carrier/agent. Regardless of whether or not you have life insurance, health insurance, or even a variable annuity, you don’t want the wrong hands getting your insurance information. I contacted my health care insurance provider, and they will be sending me a replacement card within the next 7-10 days. Additionally, they gave me critical information I needed, in the event I should end up in a hospital or go to the pharmacist. 5. Notify your local branch of your state’s DMV (department of motor vehicles). Because I have a valid driver’s license, I did not need additional identification to obtain a replacement card. However, many states may require a birth certificate, social security card, or other identification in order to obtain a replacement. 7. Contact your credit reporting agencies. If you have a very good credit rating, identity theft could ruin it and more than you could ever want. I think it was Experian (one of the three national credit reporting agencies) that has the following number: (800) 525-6285, EquiFax and Trans Union are the two other credit reporting agencies in the United States. Fraud alerts were placed with all three agencies. Within a week or two, I will receive information from them confirming communication. That leads to (8. and 9.). 8. Make sure you get a credit report (free online) within 90 days after reporting potential identity theft. You want to make sure you check for anything unusual that might arise in the report. Things like new accounts, past due payments (which you have been making monthly payments on time), any amount that you didn’t put on a charge account, and anything else that is out of the ordinary or doesn’t “feel right” to you. 9. Everything else. Contact any and all places that you have loans, co-signed or not. Contact those you co-signed with on anything. Contact credit card companies. Consider contacting other places, as needed. In closing, identity theft will exist. It’s not what happens when people experience identity theft. How people respond to being taken of their identity may or may not affect their lives in the long run to a large extent. Most importantly, stay calm as much as possible and take control of the situation. Be proactive and not reactive. Realize that you are facing a strongly adverse situation. However, don’t let your emotions get the best of you or you may find yourself feeling even worse. This information is for people who live in the United States. If you live outside the USA, contact the appropriate authorities/agencies in your country. ZakÅad szklarski oferuje szkÅo i wyroby szklane,szyby zespolone.Szklarz w Rzgów gwarantuje profesjonale usÅugi szklarskie w atrakcyjnych cenach. if i ever lose my wallet or get it stolen that will be my bad day in all my life.